"Gangnam Blues" Lee Min-ho, "Violent and intimate scenes"
Lee Min-ho has a quality of a superstar. It was hard to find the shy smile that he had when we met him in 2008 before he rose to stardom. Eight years later, he has become a great young man with a killer smile and charisma in his eyes. He was confident about his speech which made reporters proud of him. Lee Min-ho's first leading role in "Gangnam Blues" is an action movie about the passion, loyalty and betrayal of two men during the time of the Gangnam land development. Lee Min-ho plays Kim Jong-dae who joins the land of war for his simple dream of obtaining a house of his own. Lee Min-ho asked how the movie was as soon as he met us. We honestly told him that there are pros and cons and he smiled as if he expected that answer. "The movie is quite stimulating. We edited most of the violent and intimate scenes but the overall flow of the movie is much too strong. There were only good reviews about it after the premier, but later there were bad ones, too. I expected this reaction although I personally enjoyed the movie and thought it was fun. If I starred in a movie, I wanted to be a mature man in his 20s and I think this movie is exactly that. This character is much different from what I'm used to so I hope everyone enjoys it as much as I do". We can tell how he's so well-suited to the screens. There are places where he could work on more but he's so alive in "Gangnam Blues". His manly features and fit body is perfect for a 'noir' film. His flying kick brings awe to the audience. We could see just how long his 112 centimeter legs were. Although, he seems uncomfortable sitting at the low table from constantly switching positions. "I think it's the dream of every actor to attempt a noir film. I really wanted to do it without worrying about using my body for action. Many people worried about me when I first got the offer, but I was pulled into the character. I didn't simply choose this character to relieve myself of the old one. I was depressed in my early 20s because I didn't have work; I was poor and had no confidence. I reflected those emotions to Jong-dae. The director told me he chose me for this role because he remembered my cold eyes from the movie "Public Enemy Returns". He teased me that it was gone and I worked hard to bring it back". 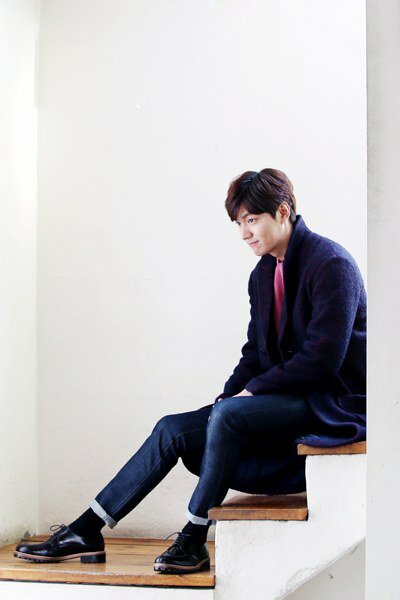 Lee Min-ho thought for a moment when we mentioned success. He's already a star in Asia and the effect of the results he creates with his decisions are considerate. He has too much pressure to think that he chose the role just because he's an actor. He knew this very well and he seemed very nervous about the release of "Gangnam Blues" in which he spent a year of his time on. "I heard the breaking point was 3 million people. I wish we could do at least that. If we break through 5 million people, I would fly. It might not be easy as it's adult rated but I can hope. If we don't do as well as we expected, that's fine. But who can we blame? It's my choice. I didn't choose this movie for the sake of challenge. The public gives me the nickname "STAR" and they can take it back if they want to. I just did my best and in the next one I want to try something more extreme. A love story with a message or a war movie like "Fury" would be fun, too". How is ordinary Lee Min-ho's life? In a recent show he starred in, he claimed that he was in love a year ago. The film promotional team said, "We tried to block that question but he's too honest". "I'm always open to romance. I'm still waiting for 'the one'. I dream about my other half meeting me on the seat next to me on a plane. However, I have to be careful. I have no choice but to observe someone I may like. Then if I'm sure, I'll make a film. That's why chances are narrow for me. It's the sad truth. I don't have any particular hobbies. I can't drink well. I drink some beer occasionally when I'm off I play games with my friends or go skiing. And I'm always searching for something new to do". ""Gangnam Blues" Lee Min-ho, "Violent and intimate scenes""